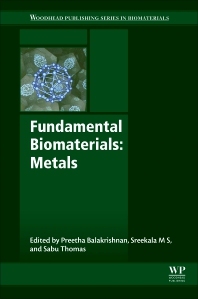 Fundamental Biomaterials: Metals provides current information on the development of metals and their conversion from base materials to medical devices. Chapters analyze the properties of metals and discuss a range of biomedical applications, with a focus on orthopedics. While the book will be of great use to researchers and professionals in the development stages of design for more appropriate target materials, it will also help medical researchers understand, and more effectively communicate, the requirements for a specific application. With the recent introduction of a number of interdisciplinary bio-related undergraduate and graduate programs, this book will be an appropriate reference volume for students. It represents the second volume in a three volume set, each of which reviews the most important and commonly used classes of biomaterials, providing comprehensive information on materials properties, behavior, biocompatibility and applications. Preetha Balakrishnan is an INSPIRE doctoral Fellow. Her area of interest is Polymer Science incorporating Nano materials, and topic of research is Starch based nanocomposites at IIUCNN, M.G. University, Kottayam, in the group of Prof. Sabu Thomas. Dr. M S Sreekala is an Assistant Professor in the Post Graduate Department of Chemistry at Sree Sankara College Kalady, India. Dr. Sreekala specialises in polymer engineering and has 14 years’ experience in the field. She serves as a reviewer for several international journals, including the Journal of Biomaterials and Nanobiotechnology.